As it was my birthday this week then it also meant that I needed to bake a shed-load of treats for my colleagues. Well I could do what everyone else does and pick up a load of treats from the supermarket but where would the fun be in that. As a baker it is a present to me to spend the day in the kitchen making lots of lovely stuff. In previous years it has been all about caramel and chocolate but this year I decided to go fruity and make Rhubarb and Orange Cake, Panettone, and Lemon Tarts. 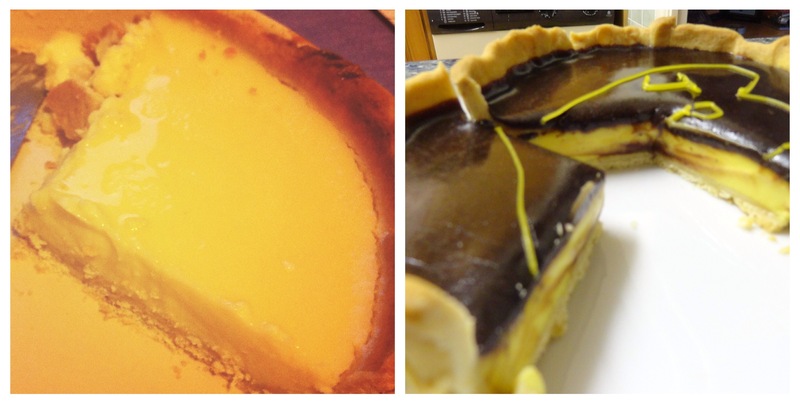 Although they all disappeared rapidly the stars of the show were my lemon tarts so I thought I would post the recipe here. Using my favourite sweet ginger pastry (thanks again Ryan) and the filling is adapted from a BBC Good Food recipe. This is a very egg heavy recipe, lots of protein but also cholesterol so you may want to leave it a few days before having any more. I weigh out the flour and icing sugar together, then add in the ground ginger and salt. Sift the mixture into a bowl and add the cubed butter and rub together. I like doing this by hand (not that I have any other choice as I don’t have a stand mixer) as it connects me to the pastry dough and gives more information than sight alone. Once the mixture resembles fine golden breadcrumbs I then use an egg to bind the mixture together and bring it into a ball. Wrap the ball in clingfilm and chill for 30 mins in the fridge as this really helps when rolling out later. After the pastry has rested and chilled then roll out to about 3 mm thick. 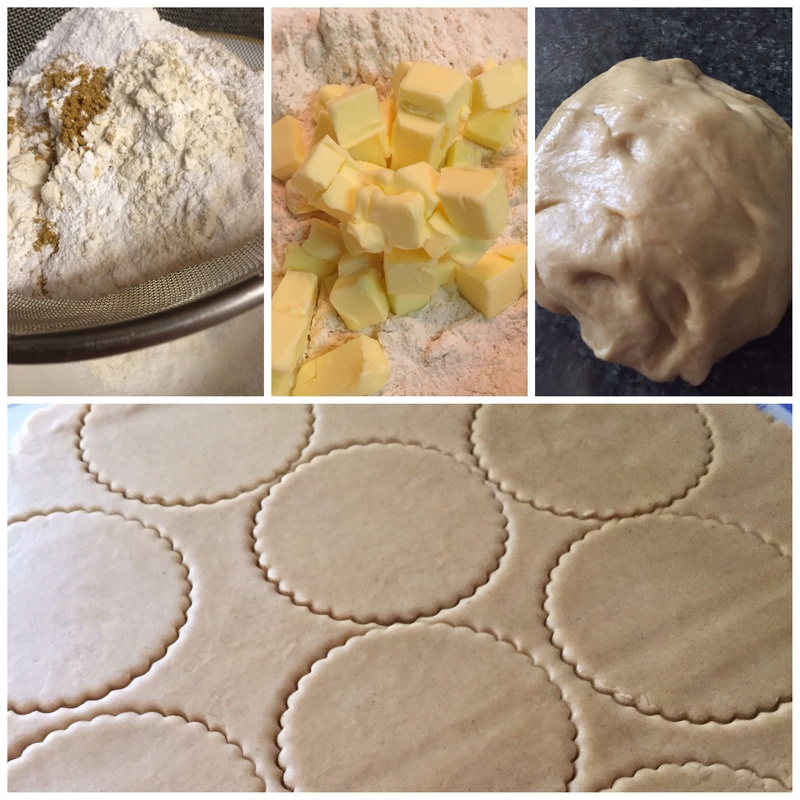 One of the reasons I love this pastry so much is that it does let you roll it out a small fraction thinner than other sweet pastry recipes I have tried whilst maintaining structural integrity. Honestly I am talking about pastry and not buildings. Using a large pastry cutter cut out as many discs as possible. One fantastic tip I learnt from Ms Ruby Tandoh on GBBO is to have a small cross off baking paper underneath the pastry in the cupcake/muffin tray as this significantly eases getting the tarts out later, particularly if some of the filling does go down the side. Once all the discs have been transferred to the cupcake/muffin tray combine the scraps of pastry and re-roll out. Repeat until cannot roll out anymore. (I managed to get 14 out of this recipe). Put the cupcake/muffin tray back in the fridge to chill for another 30 mins as this will also help to reduce shrinkage in the oven. Preheat the oven to 180oC. To make the filling, lightly beat the eggs and egg whites together in a jug. Sift the icing sugar gently into a bowl and make a well in the centre. Add a small amount of the egg mix and gently fold into the icing sugar with a wire whisk. Gentle is really important otherwise you end up covering yourself and the kitchen in icing sugar. (Can you tell the voice of experience?) Even the small amount of egg mix should be enough to incorporate all the icing sugar into a smooth thick batter with no lumps. Gradually add the rest of the egg but can now bit a bit more vigorous with the beating. Zest and juice the lemons. This is where I deviate from the recipe on BBC Good Food, as that recipe says use 4-5 lemons which I think is complete and utter overkill. 2 lemons is more than sufficient to get a deep lemon flavour without causing you to purse your lips. I would recommend organic lemons for a better flavour. Add the zest and juice to the egg and icing sugar batter and leave for the flavours to develop. Take the cupcake/muffin tray out of the fridge and using squared of baking parchment line each tart and fill with baking beans (or uncooked rice). Bake blind for 15-20 minutes, then remove the baking parchment and the beans and bake for another 5 minutes. Add a third of the crème fraiche to the egg and lemon mix and lightly whisk to incorporate. Add another third, whisk and then the remainder and you got it lightly whisk again. 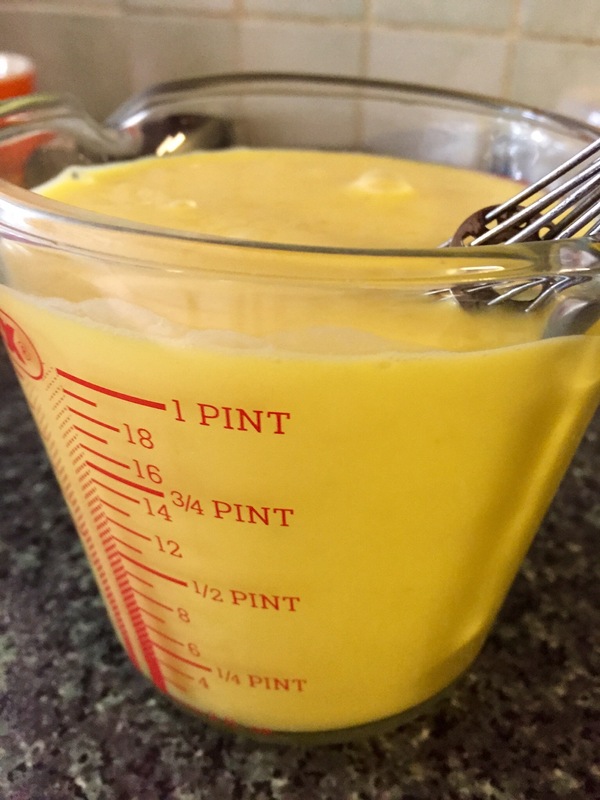 Mix should now be a pale yellow, add a few drops of yellow food colouring if you want to make it a stronger colour. The BBC Good Food recipe recommends sieving the mixture to remove the lemon zest but I do not believe this stage is necessary although it would ensure completely smooth tarts. Transfer to a jug to make it easier to pour. 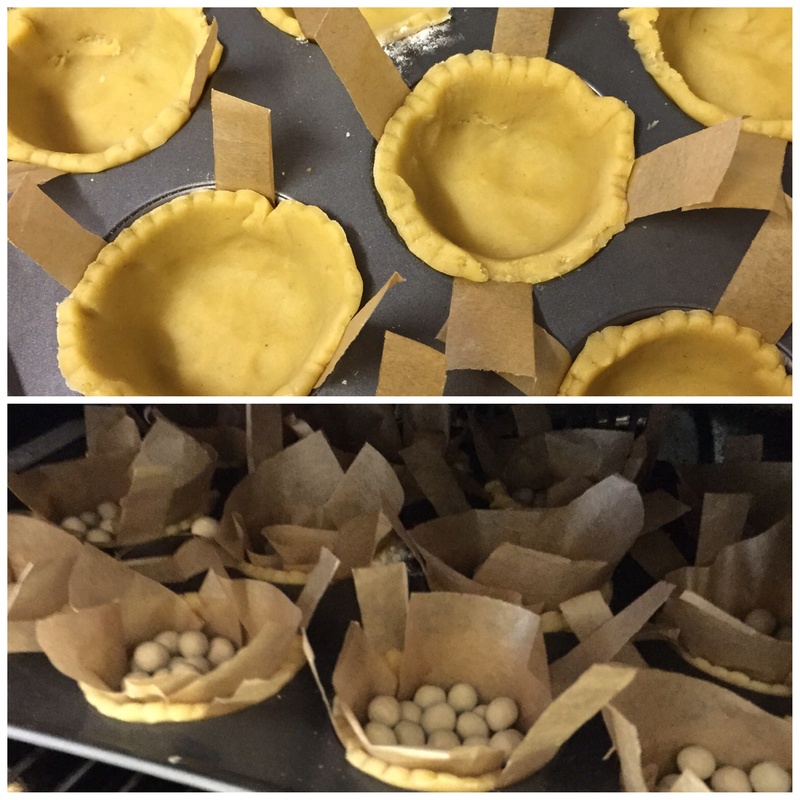 Take the tarts out of the oven and half fill with the lemon mixture then put back in the oven and pull the shelf out to let you fill them up to the top. You may also want to have a tray underneath to catch any overflow and I would recommend this strongly if you were making a big tart. Reduce the temperature down to 160oC and bake for 25-30 mins until the lemon mixture is set. Leave to cool in the tin for 10 mins and then pull on the tips of the baking parchment cross and the tart should just pop out without having to run a knife around the inside and scratching your cupcake/muffin tray. Leave to cool completely and then indulge! I have also previously used this recipe to make a large tart and also used the chocolate glaze from my Strawberry and White Chocolate Mousse Tarts. 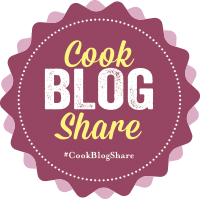 This entry was posted in Pastry, Recipes and tagged BBC Good Food, GBBO, Ginger, Icing Sugar, Lemon, Lemon Tart, Lemon Tarts, Pastry, Ruby Tandoh, Sweet Pastry. Bookmark the permalink. Happy Birthday! What a zesty way to celebrate! Happy birthday, I agree it’s like a present getting to spend all day in kitchen! 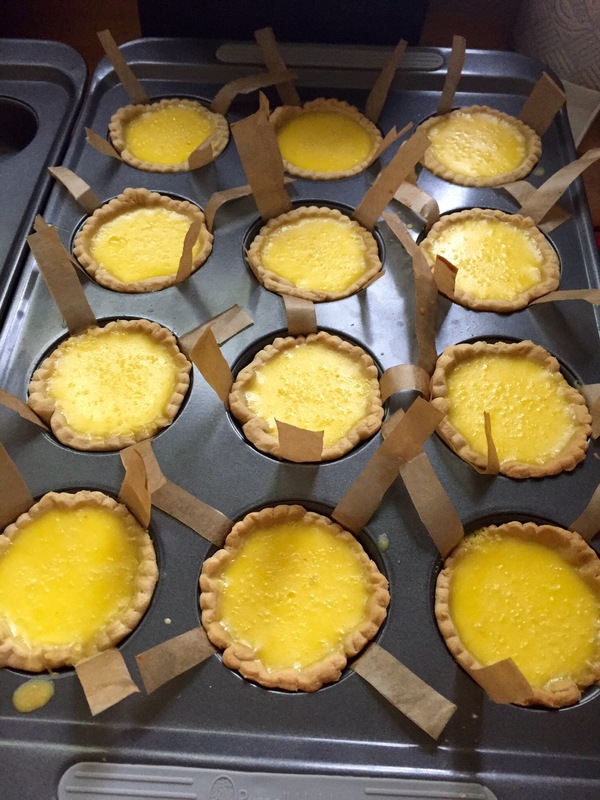 Loving looking lemon tarts! !